Villarini & Henry, L.L.P., located in the Buffalo, New York, suburb of Hamburg, offers legal services in a number of practice areas including criminal defense, personal injury, workers' compensation and sports law. Criminal matters handled by the law firm include driving while intoxicated (DWI) cases as well as a full gamut of state and federal misdemeanors and felonies. Personal injury claims involve car accidents, slip-and-fall accidents and workplace injuries. Clients seek out the law firm for a number of reasons, including the opportunity to work closely with an experienced attorney. They understand the value of a personalized approach as they pursue legal remedies such as a favorable disposition in a criminal case or an ample settlement or verdict through an injury claim or lawsuit. When we represent an injured person or someone named in a criminal investigation, we emphasize immediate results as well as protection of a client's long-term best interests. When stakes are high, it is important to know that one's attorney is prepared to advocate zealously. As former assistant prosecutors, lawyers of the law firm are ready to go to trial as needed to obtain a proper outcome. 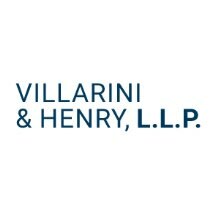 Villarini & Henry, L.L.P., welcomes inquiries from professional athletes, people accused of white collar crimes and family members seeking economic justice after a fatal traffic accident. I do not recommend Daniel Henry. Negligent. He never attempted to gather evidence to prove my innocence.